The biggest challenge for the landfill's food waste program is organizing the collection from many different schools that are spread throughout Laurens County. Collection routes need to be designed to be as efficient as possible, Snipes explained. The city schools are easier to collect from, because they're in close proximity to one-another. The county schools are more challenging, but still feasible because they have multiple schools located on one campus. The schools dispose of their waste in large 95 gallon “roll carts.” Each week Laurens County Landfill picks up these carts full of food waste and trucks them back to the composting site to be unloaded. Logistically, collections from the state prison are easier to manage than the schools. The prison generates a large volume of food waste every week that fills a 30 cubic yard roll-off container, meaning that the landfill collects more material in one trip. Prior to delivery to the compost site Snipes screens this material at the prison with a “bar screen” to remove containers that are mixed throughout. “We are permitted to compost waxed cardboard so, the milk and juice containers that pass through the screen are simply mixed into our windrows,” he said. The difference between composting food waste and the landfill's other waste streams is that food waste needs to be thoroughly blended with a high carbon material for odor control. Let food waste sit for too long without oxygen and it will quickly rot and become a stinking wet mess as it enters anaerobic decomposition. In anaerobic conditions, anaerobic bacteria release sulfur as they break down the material. In the absence of oxygen the sulfur combines with hydrogen to form hydrogen sulfide, or the smell of rotten eggs. When a compost pile is properly aerated and mixed with porous or coarse carbon materials, it creates beneficial aerobic (air) conditions for both the aerobic bacteria and aerobic chemical reactions that bond the sulfur, that is released from the decomposing organic material, with oxygen to create sulfates, which are beneficial to plant growth. Properly blending food waste with porous carbon is recommended by experts at Midwest Bio Systems, and Snipes has developed a technique that works well for his operation. This is the all-important “one extra step” that allows Snipes to manage the food waste composting without odor problems. Once the food waste reaches the compost site it is unloaded from the collection truck and immediately mixed with ground yard waste. First workers at the landfill build a bed of ground yard waste that is several inches thick. The yard waste has a high percentage of ground wood chips which are a high carbon based material. “We build a wood chip pad, with wood chip berms, and deposit the food residuals directly onto that pad. The pad is blended with the food residuals and incorporated into our windrows,” Snipes explained. 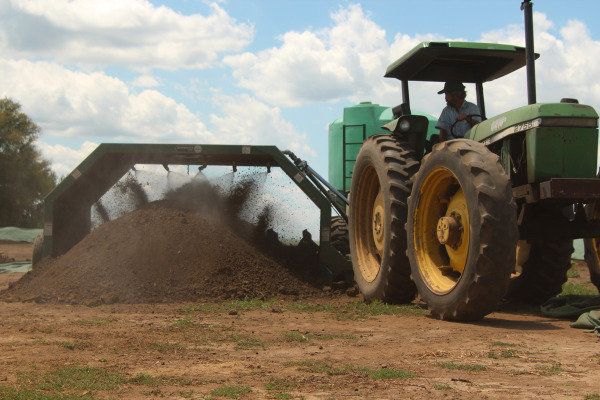 “We mix it up immediately right after having dumped the food wastes there to dry the material and to get it to a consistency that we can handle.” Mixing takes place with a front-end loader which also helps to aerate the piles. The carbon balances the nitrogen in the food waste. Snipes and crew aim for a 2:1 mix of yard waste to food waste, by volume. The yard waste is also dry and absorbs some of the excess moisture in the food waste. If odor seems like it is becoming an issue, Snipes simply covers the pile of food waste with a “blanket” of wood chips which controls odor. It can remain in this state for a few days if necessary, Snipes said. The blended food waste can sit in piles for a day or two, if needed, until one of the landfill's long compost windrows is constructed. “And then we simply blend that material in with our biosolids operation that we already have in place,” Snipes said. “It's all one operation it's just that the food residuals go through one extra step,” he summarized. The blended food waste and ground yard waste are added to existing windrows that the landfill builds from biosolids and its other major waste streams. The next crucial step is homogenizing and aerating these windrows to begin the composting process. To do this Snipes uses an Aeromaster Pull-Type Compost Turner, which has made all the difference for a quick and easy composting process. Thoroughly homogenizing and mixing food waste throughout a compost windrow is important. Pockets of food waste that are not properly blended will develop anaerobic bacteria in the same way that they would if they sat in a static pile. While blending food waste with wood chips allows Snipes to control odor short-term, trying to compost in a static pile for longer periods of time would let anaerobic decomposition take over, creating odor issues. 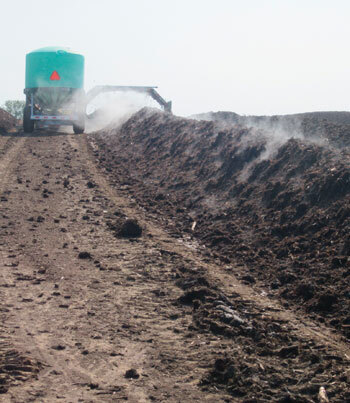 The landfill's Aeromaster thoroughly mixes the materials, including food waste, from the bottom to the top of the windrow, throughout the length of the windrow. This environment allows bio chemical reactions as well as biology from bacteria creating a small, consistent particle size that expedites the composting process and creates a high quality end product. Compared to a bucket loader, the paddles on the compost turner and its rotating drum help to create a homogenous mix throughout the windrow leading to a quick and clean breakdown. (The homogenous saying is so true, everything needs to touch everything else.) The turning operation also adds consistent aeration, ensuring that air permeates throughout the entire windrow. “If I were going to do anything differently I would have bought a windrow turner immediately, from day one, if I would have known is going to make this much difference and this big of an improvement,” Snipes said. To add the food waste blended with yard waste mixture to a biosolid windrow, Snipes creates a “trough” on the top of the windrow with the bucket of his front-end loader. The food and yard waste mixture is dumped into this trough, and then the entire windrow is turned. Adding the food waste to the top of the windrow helps to keep the food waste blend consistent throughout the windrow, and it helps to balance moisture during the initial turning. Another secret to Snipes success is that he adds a little bit of finished high-quality compost to a new windrow before he turns it with his compost turner. The finished compost holds more consistent moisture and also maintains an environment for beneficial microorganisms to help to start the breakdown of the raw material. After an initial 45 days of the composting process where temperature, CO2, and other parameters are tested, the compost is moved to a storage area where it is allowed to cure. 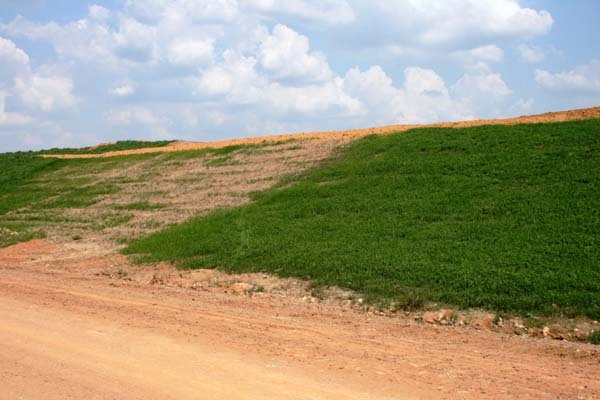 Within 10 weeks, the landfill creates a rich, high quality, compost that it can then sell to landscapers, farmers, home-owners, and use as a fertilizer replacement for seeding and maintaining the landfill's grass slopes. Thousands of tons of waste are being diverted from the landfill each year, extending the life of the landfill for future generations. And Snipes couldn't be happier. Could composting food waste, or other high nitrogen waste streams, be a good fit for your operation?